Putting my annoyance with the logistics team aside, I'm quite happy with Madeko. They have a huge range of products and their drivers/techies/salespeople are very friendly. A few weeks ago I spent an hour on a Saturday morning going through their warehouse in Maarsbergen and it was a blast. Arjan was a great fellow and really helped me out in my choice of a desk. He finally steered me towards the desk shown above, a Gispen Work desk which is height adjustable (with a crank) and which comes with a custom made desktop. The top is not made out of MDF like most desks are these days, but instead it consists of eighteen layers of plywood (multiplex in dutch). This makes the top bloody heavy (over forty kilos), but it's also sturdy and I can always sand it down and re-lacquer it if I feel like it. The frame itself is rather oddly shaped, but is pretty nifty. It's actually not the legs that extend when you crank the desk, but the desktop itself is lifted on a jack-like mechanism. Very nifty and with no wobble at all. The chair's a Comforto System 70, which is the same kind of chair we use at $CLIENT. It's been reupholstered and restored and, while a little bit wobbly, it's a good chair in the ergo department. 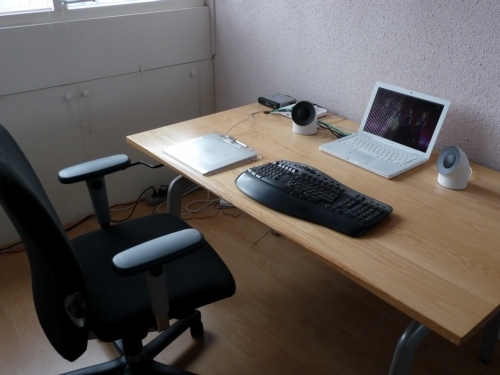 Both pieces of furniture are secondhand, the desk setting me back 150 euros and the chair 250. With delivery and taxes I ended up a bit over five hundred euros. That's a sight better than the near seven hundred euros I originally paid for the GDB Vegas desk. * Get rubber wheels for the chair so I don't damage the floor. * Cannibalize a small coffee table to make a shelf for my Macbook. * Get a Samsung 24" screen with a Flextronic LX swivel arm. Putting it all together I actually stayed almost four hundred euros under budget! At IKEA you can buy a plastic underlayer for your chair so you don't have to buy ather wheels. I was going to say the same thing :). Get one of those floor protectors. But that name! Lol. Kolon protector. If youi can't make it to the toilet at least your floor will be ok.
Good gravy, I hadn't even noticed the name yet o_O The only time I'd need a colon protector was if I went to jail... or something. Anywho, I really dislike those mats so I just spent twenty euros on new wheels. No biggie.